There is an immediate sense of dread from the moment the black fades into the overwhelming tank crawling towards us in Clint Eastwood's American Sniper. Combined with the bombarding sound design that insists your heart start beating faster it's apparent the veteran director intends to put you right in the middle of the action. It's not that the life of Chris Kyle was filled with nothing but dread or other related emotions, but it was certainly filled with a fair amount. Based on the memoir penned primarily by Kyle of the same name, Eastwood and lead actor Bradley Cooper have acquired a no frills way of telling a straightforward story about what seemed to be a very direct man. I have not read Kyle's memoir from which this film was adapted, but if you take away anything from the film version it is the state of mind of which Cooper's Kyle was always in. There is a consistent sense of complete confidence in himself that infiltrates the viewers perception of how events will play out, but where things become gray are in the contemplations of how what he is doing might fit into his overall role in life. From the teachings passed down by his father, he was bred to look at the world as a very black and white place, as a place where only a limited number of personalities existed and where the rule of absolutes made him something of a protector to those who couldn't or didn't know how to defend themselves. When it comes to portraying this type of mentality on screen though one could encounter a few issues given our protagonist isn't the most articulate with his emotions and much of the drama surrounding his wife, Taya (Sienna Miller), deals with his long absences during tours that's unfortunately become so common at this point it's hard not to convey without a hackneyed stench hanging over it. Attempting to make something more out of this or dig deeper into the material so as to come up with a kind of insight or original angle would only serve to seemingly overdo what is right in front of their faces though. And so, there are no storytelling flourishes or flowery filmmaking language incorporated, but just like the man himself, this is a very basic and to the point account that speaks volumes after the film ends by not saying much while you're in the midst. Chief Petty Officer Chris Kyle (Bradley Cooper) is reunited with wife Taya (Sienna Miller). Beginning in what we come to learn are the moments right before his first kill, we are able to quickly catch a glimpse of the man that will take us through his life. It is in the split second of this decision that we are taken back to his childhood to see what in fact formed the mind of what would become the most lethal sniper in U.S. military history. Efficient and intent to give as full a picture as possible Eastwood and screenwriter Jason Hall define the initial motivation of Kyle through the combination of his fathers philosophy and the regular attendance of church by his family. He steals a bible to keep close to his side while his father gives him guidelines after he beats up a kid at school to protect his younger brother. There is no time dedicated to the character development of a younger self or even to the parents as it isn't necessary because the sole focus here is Kyle. In doing these things we are presented with the films few glaring issues in that there is a stop and start nature to the pacing and we never see Kyle within the context of the bigger picture. The back and forth structure on which the film operates is understandable if problematic because the momentum that Eastwood builds during the wartime scenes is diminished when we return stateside to see the natural repercussions of Kyle not being able to leave the war behind in his day to day. As for the context, this isn't as much an issue given the film, as I assume the book does, gives us the story strictly from Kyle's perspective. Much of the events we see are small moments that are significant to the personal journey of our protagonist, but build no tension and give no education as to where Kyle's company or the U.S. in general are at in terms of winning or losing the war. We are taken on missions and we are given certain targets to acquire within which we see the character of Kyle protrude even more, but then the scene will cut to Kyle being back at home, waiting on his second child and the shift is something of an abrupt adjustment given the sections detailing Kyle's time in Iraq are naturally more compelling. Much of these miscalculations can be forgiven on the basis of Cooper's performance alone. From the first moment we glimpse his Kyle perched on a rooftop and hear his Texas drawl spew humorous retaliations at his comrade we get a sense of who this man is. The key to understanding the role of Kyle in the war is in understanding the responsibility thrust upon him by having to make decisions that either take a life to save more lives or take a life to possibly save more lives. There is never a clear line and so it is the gut instinct of this single person that allow the troops on the ground to either feel invincible or merely secure. Kyle takes this willingly as his cross to bear. Kyle develops his skill early and it's made clear he has a gift of sorts for seeing what others may not, a precision that is unlike any other and like so many who stand above in exceptional ways it is the downside of this seeming singularity that haunts him. He is celebrated for his skill, but psychologically he pays the price for what he is doing with that skill. How can something be worth celebrating while simultaneously detracting from his overall quality of life? It is a question you can see reeling in Cooper's mind countless times throughout the film whether it be when he is looking through his scope or at his children. As mentioned earlier, it is clear Kyle wasn't necessarily the most expressive of people when it came to discussing internal struggles and conflicts and while I'm sure his book (which was written with the aid of two co-authors) gives more insight than those around him might have ever glimpsed we, as the audience, are playing the role of those around him. This stoicism only puts more of the responsibility on Cooper as Eastwood entrusts his actor with the task of communicating to the viewer how he may or may not be addicted not necessarily to the thrill of war, but to holding up his end of the bargain. Kyle believes if he is willing and able to help defend his country than that is what he should be doing. He clearly understands the pull and the attraction of responsibility, but he doesn't necessarily understand the need of his presence at home as much as he sees the need for his skill on the battlefield. It is in each of his facial expressions, precise reactions and overall consistent demeanor that Cooper captures this mentality and makes the film more about the character study than anything else. Cooper as Chris Kyle in director Clint Eastwood's American Sniper. As we feel we get to truly know the titular Sniper because of Cooper's strong showing it is also through him we feel the resistant arc of a man who always had absolute ideals to determine his objectives. It is through these experiences we're enlightened to that he comes to believe in something a little more layered and this is where the film accomplishes its major goals. 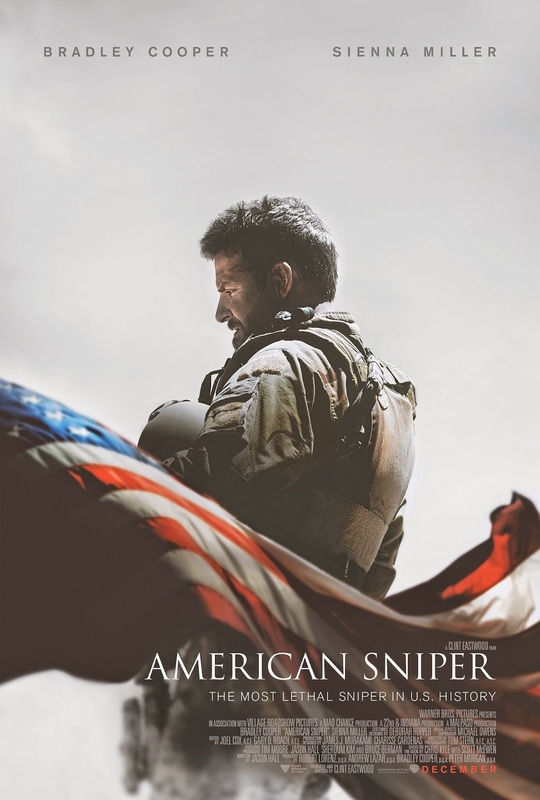 While a film can never fully convey the complexities of one persons mind and as good as Cooper is he will never know the way in which thoughts actually passed through Kyle's head and yet American Sniper still does what it can to deliver the essentials. It's not about trying to create conversation around the nature of war or even the Iraq war in particular, but more about telling this one mans incredible story. In terms of who this man was and how he is represented on screen it couldn't feel any more appropriate as Eastwood, the director, has an unrelenting edge to him that consistently comes through as it hasn't in some time. This assured hand, held steady by Cooper's performance give the film an honest brutality present both in the emotions it elicits in the chemistry between Cooper and Miller as well as in the moments when we are forced to watch the violent savagery of what Kyle witnesses on a daily basis. There is a ruthlessness to the warfare depicted and a level of insignificance to the life these soldiers see taken that strikes a chord. As much as there is a pain for the lost lives they are unfamiliar with, the ones that hit home for Kyle are those of the fellow soldiers he couldn't save. He sees this as a failure on his part and something he almost has to atone for despite him technically bearing no responsibility for his comrades choices. It is a headspace worthy of examination and while Eastwood's film operates on some conventional standards and predictable framing the content is more than compelling while the lead performance of Cooper is transcendent in the way that Bradley Cooper, the actor and personality we see on talk shows, disappears completely into the role of this Texas military man. 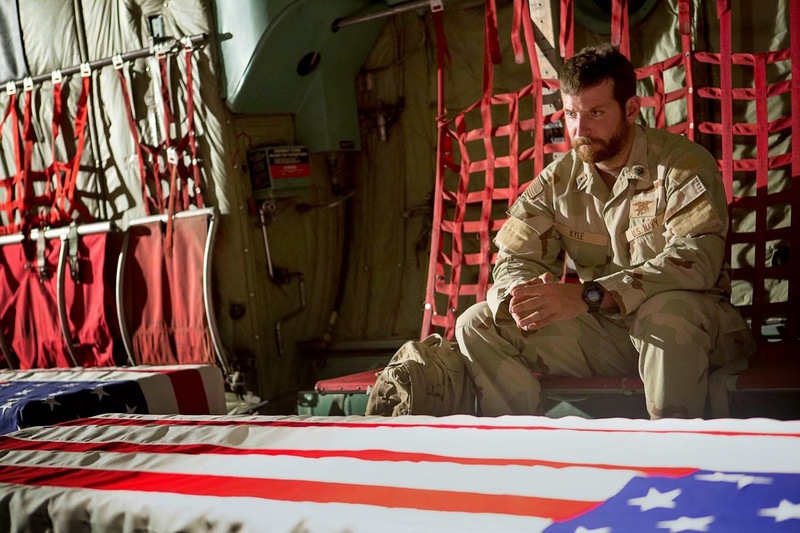 American Sniper isn't here to give you a pro or anti-war message and it's not here to celebrate Kyle's proficiency for killing people, but rather it exists to provide a portrait of the disenchanting side effects of being a patriot, the toll it takes and the price you pay.